If you have suffered a lower-body injury in a car accident, your injuries may require extensive medical treatment. When we talk of serious car accident injuries, we often think of head injuries, spinal cord injuries, and internal organ injuries. However, there are various other types of injuries that can occur as a result of a serious car accident. In the case of a front-end collision, the driver or passengers are thrown forward in their seats and may suffer injuries to the lower extremities in addition to upper body injuries. 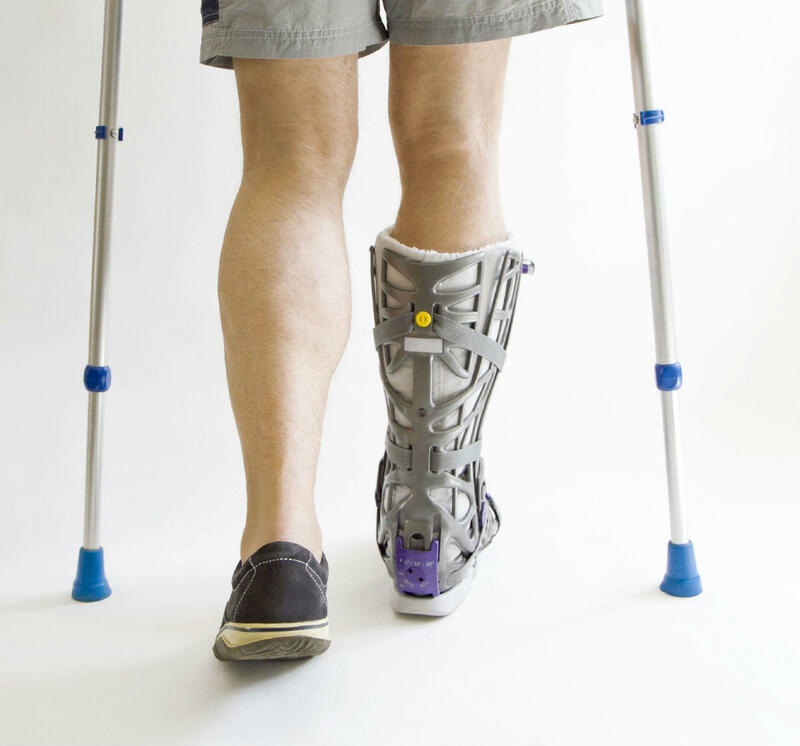 According to the available estimates, 20 percent of the car accident victims reporting to trauma centers suffer from some kind of lower leg fracture. According to the National Highway Traffic Safety Administration (NHTSA) report published in 2005, 5.7 percent of the lower leg injuries affect the ankle. It is also noted that foot and ankle injuries make up 8-12 percent of all moderate to severe injuries suffered by those involved in head-on collisions. A large percentage of the injuries occur when the foot, ankle or lower leg hit the foot of the vehicle. These injuries may also occur when the lower leg or the knee hits the instrument panel due to the impact of the crash. Injuries can also occur when the knee hits the steering wheel. Lower leg injuries resulting from head-on crashes are considered high energy injuries because they occur at high speeds and cause more extensive damage compared to slip and fall injuries. Lower leg injuries are rarely fatal but often result in long periods of mobility loss. The costs associated with lower leg injuries are very high. Depending on the severity and type of the injury, the victim may have to undergo multiple surgeries and physical therapy. Even a year after the injury, the victim may still face problems. According to the NHTSA report, of those who suffer moderate to severe injuries of the limbs, only 58 percent had returned to work after a year. Around 50 percent still suffered minor to moderate impairment. Those with multiple fractures and foot fractures showed little improvement. Thigh injuries sustained in car accidents may involve a fracture caused by forced trauma involving the steering wheel or dashboard. The impact of a car crash can crush the femur, the large bone that runs from the hip to the knee. Femur fractures often require surgical treatment and pins are used to hold the broken pieces of the bone in place to aid healing. An injury to the hip is common in front-end collisions. A common hip injury is dislocation of the hip joint that requires insertion of surgical hardware such as screws and plates to ensure that the bone heals correctly. Hip fractures may require a complete or partial hip replacement. Fractured, dislocated, or a bruised pelvis can also cause severe pain and require a prolonged recovery period. The ankle is an important load-bearing part of the body and combines strength, stability, and flexibility to perform the job well. In a car accident, the force of impact can cause sudden and extreme stress to the ankle. The ankles support a person’s entire body weight and must be flexible enough to move and maintain ambulation and balance. An injury can affect the victim’s ability to function normally on a daily basis. In the event of a crash, the natural reaction of driver or passenger is to brace themselves for the impact; however, this can cause the ankle to sustain a severe compression injury. If you have sustained serious injuries in a car accident, such as those involving the lower extremities, your health insurance, and car insurance may provide coverage for the medical bills. If the accident was a result of another driver’s negligence, you may be able to file an injury claim against the driver responsible for the accident. If you have suffered a foot or lower-body injury in a car accident, your injuries may require extensive medical treatment. Contact a St. Louis car wreck lawyer to learn about receiving compensation from the at-fault driver. Call The Hoffmann Law Firm, L.L.C. at (314) 361-4242 for a free consultation.